What is Body Psychotherapy, and what does it do? 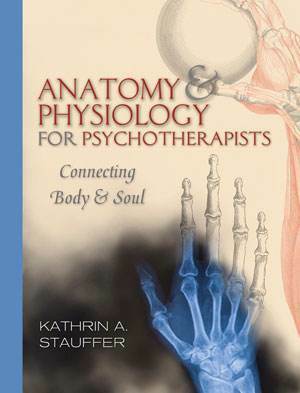 Body Psychotherapy regards human beings as composed of body, soul, mind, and spirit. Only if those four component parts work together will they form a whole, fully alive person who is as big as they can be. Body Psychotherapy aims to help people to achieve this, everyone in their own way. There is a Grimm tale, ‘The Bremen City Musicians’, which captures this idea in an image. The body is depicted as a donkey, as the workhorse that we rely on to function without complaint. The soul is depicted as a faithful dog that has the ability to ‘sniff out’ what is good for us. The mind is depicted as a clever and independent cat. The spirit is depicted as a fiery cockerel that can see far ahead and predict the weather. The donkey gets tired and weak. The dog loses its ability to hunt by smell. The cat prefers to just sit behind the oven and daydream. And the cockerel sells out and makes predictions that it thinks will please its employer. This is a realistic representation of what happens if we cease to function as a unit, and depend on others instead of taking responsibility for ourselves. Our bodies get stressed and tired and ill, our feelings get dull and no longer know how to hunt down what we need, our minds start to lose touch with the real world and live in fantasy, and our spirits value pleasing others more than keeping to our truth. In the story, the animals are threatened with death — and indeed, in this state we may experience ourselves as being threatened. We may feel anxious, or just depressed and listless and ‘not right’. Almost certainly will we experience life as hard work, as a struggle. 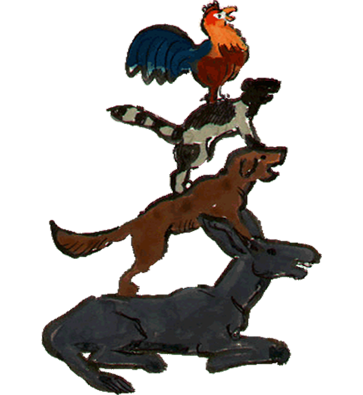 The story further tells us that the four animals get together and walk away from dependency. They then get lost in a dark wood. But in this dark and lost state, they recover their ability to function as a unit, each animal according to its nature, and together they form a whole that is much more than the sum of its parts. The picture shows this whole in the moment when all four animals make as much noise as they can, and the result is so awesome that the robbers (who have usurped the animals’ home) run away. So the animals gain what they need, which is their own place in the world, a warm and nurturing place, and they gain it by making as much noise as they can, all together. This is the sort of work that body psychotherapy can do. Many of us have a capacity to walk out on dependency, although sometimes it is good to have help in looking at what is stopping us. But walking away is only the beginning of the story. When we start to get lost in the dark places of a frightening world, it is good to have a therapist who can help. Maybe we need someone to see the light in the distance. Or we may need someone to help us stay true to who we are instead of selling out to the next robber who comes along. Or we may want help finding a way of putting our body, soul, mind and spirit back together in the right order, so that we can claim our ‘home’, whatever that may be. 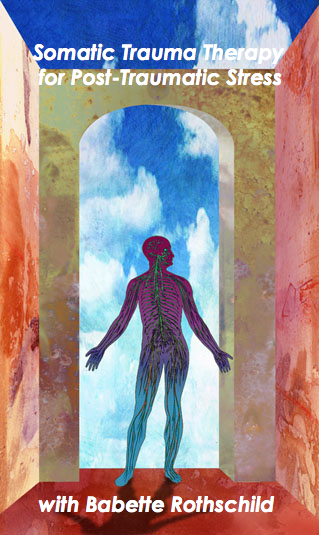 Body Psychotherapy is a form of psychotherapy that regards the mind and the soul as embodied. It traces back to Wilhelm Reich, a disciple of Sigmund Freud who first proposed that body sensations are functionally identical with feelings. This means that what we experience is expressed in the body as well as in the mind, and in order to deepen our understanding of whatever we are suffering from, we can either work with the mind (as in talking) or with the body. In either case are we going to access the unconscious ground out of which each momentary feeling arises. In a body psychotherapy session, the client may either sit, or lie down on a mattress, or stand and perhaps walk around or move in some other way. Bodily postures are explored, and spontaneous gestures or movements are followed because they give us access to our inner aliveness. Clients may also receive biodynamic massage, either regularly or occasionally, if this is judged to be appropriate and desirable by both client and therapist. For the management of a crisis, or for relief of a temporary stress situation, short work of perhaps up to 12 sessions may be appropriate and sufficient. For more in-depth work that aims to re-structure the deeper functioning of a person and the learning of new emotional skills, longer term work of two years and more may be necessary. It is difficult to estimate the length of time that an individual therapeutic journey will take, because each person is different, and no two therapeutic processes are alike. Body psychotherapy can change your life, so if you are not happy with your life as it is, it may be worth embarking on this journey. EMDR is a technique specifically tailored to help decrease the symptoms experienced in the wake of a traumatic experience. Most of us have traumatic experiences at one time or another. Such experiences tend to leave deep traces in our physical and emotional functioning, so that we can feel as though we are still affected by an event that lies a long way in the past. EMDR is very successful in helping to erase the traces of such experiences, so that although we still remember them, they lose the power to affect us strongly. EMDR can also be used to decrease the symptoms of phobias. An initial assessment will be made to see whether EMDR is the right approach for you. After that, improvements in symptoms are often seen after just two or three sessions, or it may take longer. EMDR may also be a part of a longer psychotherapeutic process if and when it seems a good idea. Biodynamic massage is a massage that has a psychotherapeutic framework. It accesses the soul of a person through physical contact with their body. It was developed by Gerda Boyesen, a Norwegian psychotherapist and physiotherapist. She made the discovery that the digestive tract not only digests food but also experience, and that this function is necessary for a healthy person. When we are under stress, or have learned in our lives to not complete whatever we experience, this function does not do its job properly. Biodynamic massage can gradually re-establish the normal self-regulation of the body and its natural self-healing capacity. Technically, biodynamic massage is eclectic and uses a wide variety of strokes. It is the speciality of biodynamic massage therapists that they tailor each individual massage to whatever the client needs right at this moment. Most people experience biodynamic massage as gentle and pleasant, and it works the better the more enjoyable it is. It should never hurt or be frightening. Biodynamic massage can be part of a psychotherapeutic process, or it can be a complementary therapy in its own right. In either case, a minimum of six sessions, at weekly intervals, will be necessary in order to give the client a sense of whether this is the right therapy for them. Biodynamic massage has the potential to provide relief for physical symptoms such as headaches, sleeping difficulties, musculoskeletal pains, or circulatory problems, all of which are symptoms of an imbalance in the body’s natural self-regulation. States of mild depression and anxiety are also helped. Mostly biodynamic massage is for those who would like to develop a more fulfilling life and who believe that living fully in their bodies is a key to that. If you present for biodynamic massage, you will be asked to say something about yourself in a first session. You will be kept comfortable, warm and safe at all times. You may remain fully or partly clothed during the massage if you wish. Supervision is a central part of each therapist’s life. It is the place where we talk about what we do and reflect on it in the safety of a supportive relationship. We can let a client come into the room and get a sense of how it is to be them. We can explore how we have responded to particular challenges and see how we could respond differently another time. We can get a sense of the relationship between us and our clients and how that reflects on the clients’ inner life. We can look at what we need in order to enjoy our work more, or in order to hang in there when it gets difficult. We can ask an experienced colleague how to handle tricky, embarrassing, or frightening situations. We can also discuss how we contract the work with our clients and how we can modify that if necessary. Good supervision is an investment in our professional future. It is also an essential part of a therapist’s self care and the service we provide to our clients. If we feel the support of our supervisor in our every day work, we will be better therapists, find our caseload easier to bear and have the capacity for more clients. Weekend Workshop 'Making Trauma Therapy Safer' October 21-22 2017 now open for booking!